ACADEMICS HAVE urged authorities to fully disclose information about the radioactive waste found at Laem Chabang Port and investigate the shipment’s entire route. booming tourism industry is nonetheless experiencing uneasiness like never before amid safety concerns and growing discontent over declining arrivals from China. Minister attached to the Prime Minister’s Office Kobsak Pootrakool believes the establishment of the Eastern Economic Corridor (EEC) is a model approach for future economic development. The prime minister is concerned about the weather situation in the South, and has directed every agency to help victims as a matter of urgency. According to the Director-General of the Excise Department, the agency is studying the possibility of levying taxes on food that contains a concentration of salt or fat, saying that the new regulation would prioritize the health of consumers. The Election Commission (EC) is planning to disclose its method of determining the boundaries of electoral districts for constituencies nationwide. Engineering is one of the key drivers of the Thailand 4.0 policy. Therefore, Thammasat School of Engineering has been developing its curriculum to produce young engineers with excellence in digital technology. There are many innovations proving their success. Newly-elected Democrat Party leader Abhisit Vejjajiva has vowed that under his leadership the oldest political party will pursue economic policies that will help reduce income inequality and ensure growth. A former Saraburi-based cavalry soldier, Corporal Panuwat Pancheun, who was reportedly fired from service three months ago for assaulting his superior, has allegedly shot and injured his 28 year old girlfriend at her family’s home/grocery shop in Prachin Buri province this morning as he tried to drag her out to his car. ORIGIN PROPERTY PLC, a listed property company, expects its annual revenue to double from Bt16 billion this year to Bt32 billion in 2023 through the offer of a digital platform for services to homebuyers under the banner of “Smart Service Living Solution”, chief executive officer Peerapong Jaroon-Ek told The Nation in an interview. Two men working for Pattaya City Hall face criminal charges after a pair of Chinese tourists complained they were fined B2,000 for discarding cigarette butts and never received receipts. Heightened cooperation between six countries as part of the anti-drug Safe Mekong initiative has contributed to the interception of large drug hauls entering Thailand from neighbouring countries, Office of the Narcotics Control Board (ONCB) secretary-general Niyom Termsrisuk has revealed. Phuket Police on Wednesday (Nov 7) arrested a Chalong-based drug dealer and seized over 52,000 methamphetamine pills (ya bah) and 784.82 grams of crystal methamphetamine (ya ice). Recent news reports have revealed that the relatives and allies of ousted Thai prime ministers Thaksin Shinawatra and his sister, Yingluck Shinawatra, have formed a new political party – the Thai Raksa Chart Party. The southern provinces of Chumphon and Prachuap Khiri Khan are being battered by a heavy inundation triggered by days of rainfall. Iconsiam, the Bt54 billion (S$2.2 billion) megacity project of future living today, has opened as an iconic landmark of Thailand’s eternal prosperity on the Chao Phraya River. The Government Savings Bank (GSB) is offering special promotions at the 13th Money Expo in Chiang Mai during November 9-11, 2018, at Central Plaza Chiang Mai Airport. SINCE ITS ESTABLISHMENT nine years ago, Origin Property has seen its pre-sales value climb from Bt198 million in 2010 to Bt24 billion this year, mainly due to its success in building residential projects suitable for different groups of people. 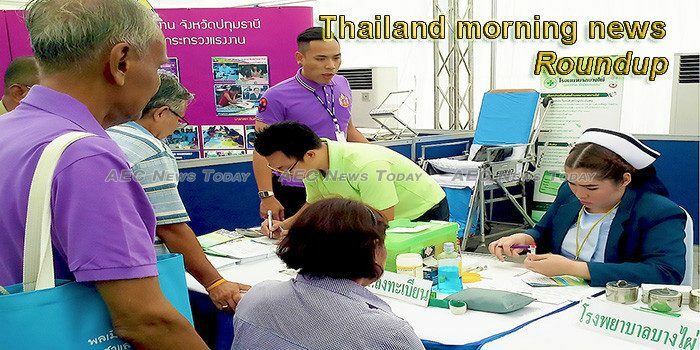 The Bangkok Metropolitan Administration has held a Sustainable Thai Idealism activity by dispatching a mobile unit to provide services to members of the public. Authorities are calling on the general public to fly lanterns during Yipeng and Loy Krathong festivals only within specific periods of time to prevent possible accidents in aviation. The National Legislative Assembly (NLA) has endorsed the amendment of the Narcotics Act, B.E. 2552, and handed it over to the administration for consideration. The Bank of Thailand has reworked the rules controlling residence credits to elevate the standards applying when financial institutions are considering loan applications. The Law Reform Commission of Thailand is set to introduce an initiative to minimize hurdles for people pursuing careers. Chiang Mai will organize World Robot Olympiad 2018 (WRO 2018) during November 16-18, 2018. Ang Thong Hospital has confirmed that Ivermectin, an antiparasitic drug, can be used to treat both humans and animals and that there has never been a report of any fatality from using the medication.